That one is a unique beauty. I can’t help but wonder what ancient catastrophe caused the stripe. Yes, Susan, I wonder about that too. 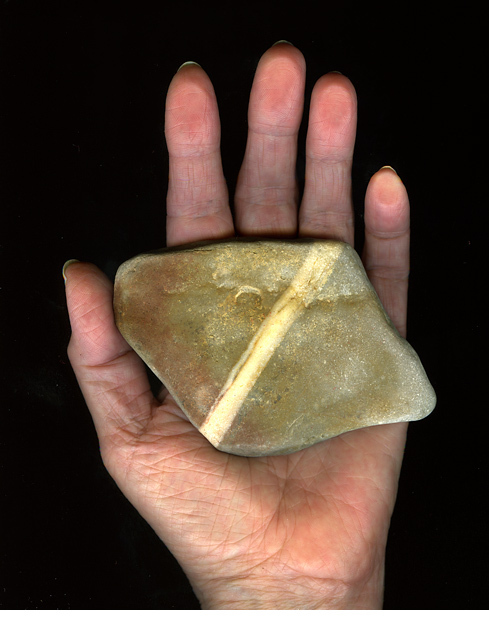 In fact, there’s another, a larger rock on the same windowsill that I’d photographed and posted years ago, calling it my dinosaur rock. Back then I also wondered what kind of ‘geologic journey’ it had travelled to finally land on a local beach. Tom, you made me chuckle over “lovingly and warmly”. Hardly how one can describe the immense geologic transformations on this earth. Quite some years ago we watched a splendid film series on our CBC called The Geologic Journey which you may find interesting as well. As Tom says, I discovered from an excellent television programme about the geology of Scotland that such rocks were formed when two types of rock were liquid together. A kind of early raspberry ripple effect! I love such rocks, and yours is no exception. I also very much like the small circles: one seems an indentation, another a stain, or the signs of a lichen -? With your hand the whole image conveys power in a way that the smaller rocks didn’t. As I mentioned to Tom, we discovered a superb film series on TV too. A second series called Geologic Journey II included one called Tectonic Europe, which included, as I recall, the north Atlantic region including Scotland and Iceland – most fascinating indeed. We had bought both DVD sets and now I feel like watching them again. I’m glad you noticed those odd marks, like fingerprints in a way. What is their story? I’m pleased you like the whole image though I did not feel the scale of the stone fit into the print series itself. Marly, as you know I love old things and rocks. But heh, I didn’t think I was making a statement as such, but now that you say so, I see that I am! Whee! That’s true, Marly, though I never think of it quite that strongly. I should and will, thanks! That is really amazing. I have never seen a rock like that. Hattie, yes, that is why it caught my eye. At first I thought it was a piece of floor tile.